Daisy’s Doghouse on Hertel and Norwalk Avenues is a pet boutique for local dog owners on the hunt for something a little different. You could also say it’s Lisa Samar’s pet project. Samar opened shop in 2015 after 25 years with Great Arrow Graphics. 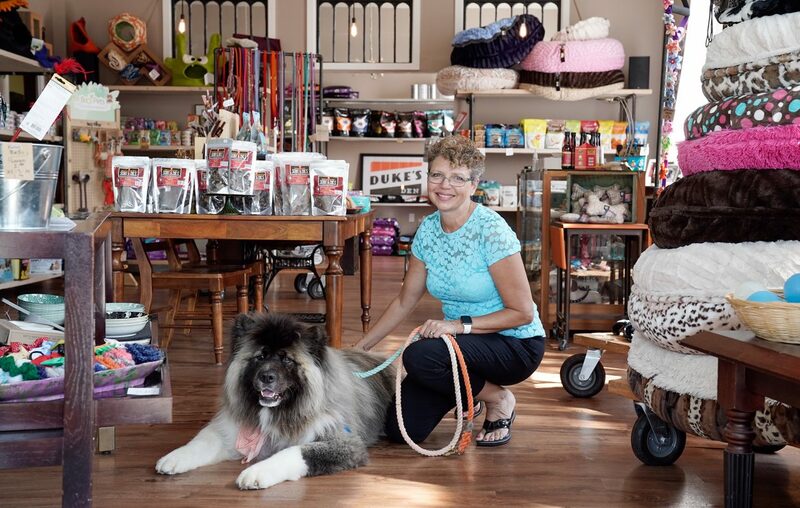 Or maybe it’s her pet’s pet project: Her longhaired Akita, Daisy, is the store’s namesake. “It’s always been my dream to own a pet store. There are so many options at big box stores, but it can be overwhelming. Here, we do a lot of problem solving with our customers,” says Samar. The inventory is all made in the U.S. from reputable brands that Samar selects, like stylish bowtie and collars from Hounds Abound in Massachusetts in plaid, seersucker and polka dot designs, and handmade pet beds by Bessie and Barnie that are environmentally safe, easy to clean and really, really fluffy. Or maybe your pup would prefer a selection from Fetch Gourmet Dog Treats, based in Cheektowaga. In addition to splurges, Daisy’s has an entire room dedicated to dog food with fan-favorites Victor, Fromm and Pura Vida. “Many issues seemingly fade away when a dog is given a good food. But we’re always here to help and give our best recommendations when it comes to feeding your little guy or gal,” said Samar. Dogs are encouraged to visit with owners and can even have their picture taken for display on the store walls. “Every day here is different. But this is a neutral place for all. It’s the most fun when an impromptu play date breaks out,” adds Samar. Gus prepares to enjoy his special cake from Bark for Biscuits Dog Bakery. According to Scientific American Mind, 90 percent of pet owners in the U.S. consider their pet part of the family. It should come as no surprise, then, that some people throw birthday parties for their dogs. That’s where Barks for Biscuits Dog Bakery comes in. Diana Cusimano and Tracy Corrigall have been baking up delicious and healthy cupcakes, cookies and cakes for canine companions since 2013. The goodies are made with all-natural, high quality ingredients like brown rice flour, natural peanut butter, organic eggs, olive oil, honey and cinnamon. Even the icing is made with a sugar-free yogurt made specifically for dogs. “Everything we offer is wheat- and gluten-free, which are the most common allergies in dogs. There aren’t any added preservatives either. It’s completely safe for humans, but maybe a little crunchy for us,” Cusimano said. Over the years, Barks for Biscuits has been part of many celebrations, from birthdays to puppy showers to pet store anniversaries. “When we see the dog jump on the table to steal a bite…that’s our favorite part,” Corrigall said. The decorative designs — Harley Davidson, Fleur De Lis and flamingo-themed cakes — are certainly worth storming the table for. You can find Barks for Biscuits treats at local pet boutiques including Notorious D.O.G., Daisy’s Doghouse and The Laundromutt. Personalized orders accepted with a week’s notice via barksforbiscuitsbakery@yahoo.com or Facebook Messenger. October is National Adopt a Shelter Dog Month. The Erie County SPCA offers pointers — and questions to ask yourself — if you’re considering adding a furry friend to your family. What’s your lifestyle like? Are you home a lot? Are you an active person? Are you expecting any life changes in the near future? Are you moving? How often will the dog be around children? Is someone in your immediate family expecting a child? Are there other pets in the home? Have you done your homework on the particular breed? These will help you narrow down your options…especially before you get there. “All rational thinking goes out the window when a dog is in front of you,” says Gina Browning of the Erie County SPCA. You can also speak with an adoption counselor to help find the right fit for your life. For more information, call 875-7360.